The author, A.J. York, sent me a copy of this work of fiction in exchange for my review. 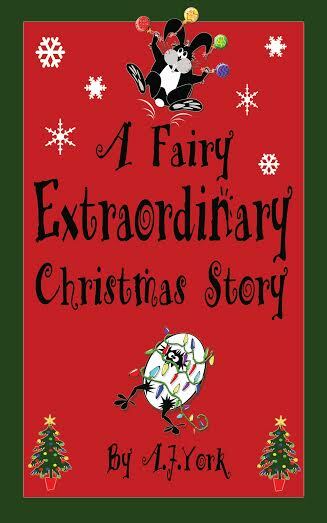 A Fairy Extraordinary Christmas is a charming early reader story sure to become a modern holiday classic. The story is an easy and quick read with the familiar storyline of toys coming to life when the humans can’t see them. The story is happy, light, optimistic and a perfect read with or to little ones. It shows how people grow up, grow apart but can come together again. Tallulah is a childlike toy full of wonder when she arrives at the human home. The Hummel-like snowball throwing children act as her guide to how a decoration should behave. There are a short list of rules and some of the decorations exhibit a seasonal dissatisfaction when they go back into the attic but the decorations old and new build a family sort of framework of companionship and aid in the time that they’re not called upon to sit in their assigned places. When the box of children’s toys appear in the attic they know that things are changing but cannot know how much. While not the most unique idea for a holiday story (see Toy Story, The Nutcracker and Babes in Toyland) the presentation of A Fairy Extraordinary Christmas Story is flawless in its flow, direction and purpose. Children are normally given a shortcut story in early reader book assuming that they can only comprehend simple principals. York gives young readers a complete story with fleshed out characters and complex problems. They may not understand the book completely as they read it themselves but each early building block helps a child better understand the principles and ideas when they stat to experience them in life. If you celebrate Christmas and are looking for a sweet holiday read for the early readers and young at heart in your life, pick up A Fairy Extraordinary Christmas Story today.